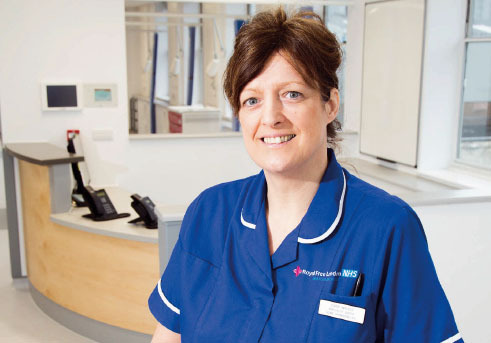 Renal nursing is an ‘ever-expanding specialty’ that can provide nurses with a range of future career options, according to DIane Walker. When Diane Walker asked about a discarded machine in her hospital’s storeroom during her nurse training in the 1980s, she was told it was for kidney dialysis but no one knew how to use it. This prompted her to take the ENB renal nursing course as soon as she qualified. ‘Dialysis nursing has come a long way since then, and is now one of the fastest developing specialties in our profession,’ says Ms Walker, now a home and supported self-care dialysis specialist sister at the St Pancras Kidney and Diabetes Centre. This new self-care dialysis unit at London’s St Pancras Hospital is one of the first of its kind in the UK. The unit opened in April, with a supported patient self-care training area where up to 72 patients can perform all or part of their kidney dialysis at a time convenient to them. Ms Walker says it is ideal for patients who don’t have the space at home, or who prefer to have a nurse nearby during dialysis. It can also serve as a supportive transition between hospital and independent home dialysis. Ms Walker liaises between hospital and community renal services to provide home dialysis patients with phone support and visits, and is training the unit’s nurses to teach self-dialysis. Patients have to achieve a set of competency levels before they can self-dialyse. Step one is thorough hand washing, after which they are shown how to weigh themselves, take their blood pressure and record the readings before preparing their access line. About 60% of the unit’s renal patients also have diabetes. Uncontrolled diabetes can damage kidneys, so patients are educated about the importance of controlling their blood sugar and blood pressure, and about kidney disease, diet, infection control and medication. Ms Walker knows that patients learn at different rates. ‘One patient learned everything in a week, while others might take three months to feel confident enough to dialyse themselves. Some prefer just to wash their hands and record their weight. If that is their preference, it is fine by us,’ she says. The new self-care unit, along with three other kidney care centres in north London, is part of the Royal Free London NHS Foundation Trust. Senior dialysis matron Janice Ward strongly refutes the suggestion that such centres are a way of cutting back on nursing staff. Ms Ward says renal nursing is an ‘ever-expanding specialty’ which can provide nurses with a range of future career options, including work in high dependency renal units, specialist nurse-led clinics, community dialysis and renal transplant nursing.